The owners of this Elwood home were ready for a backyard overhaul to transform their large space into a multi-zoned entertainer’s dream. They hired experienced landscape architect, Kate Patterson, to come up with a design that is traditional in layout and style to complement their period home, but with a bit of a twist. East Coast Pools was brought in to build the pool and bring the vision to life. 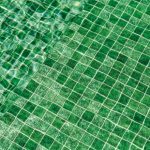 The owners opted for gorgeous green mosaic pool tiles instead of traditional blue tones for a slightly different look. At night, the green tiles create a moody and enchanting ambience that changes the feel of the backyard. 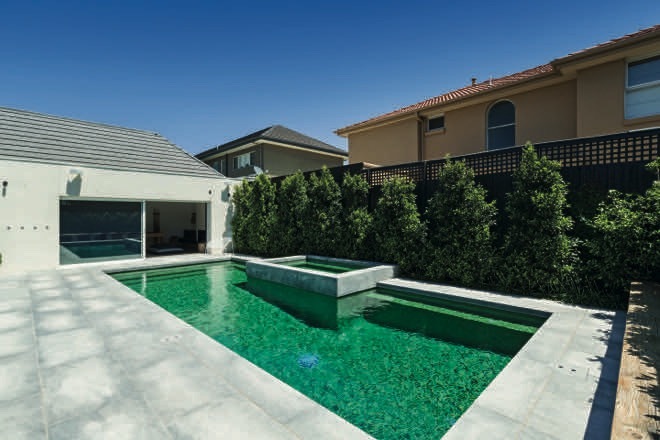 To complement the green pool tiles, a timeless, pale-grey granite has been used for the pool surrounds. 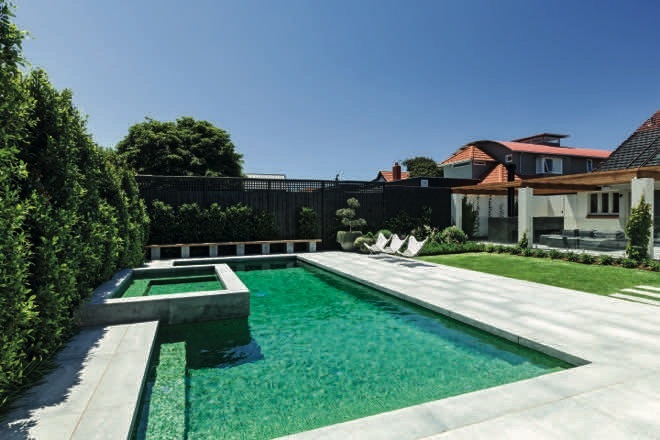 The 10m x 5m pool has been positioned in the back corner of the property to allow for a sizeable alfresco as well as a grassed area. 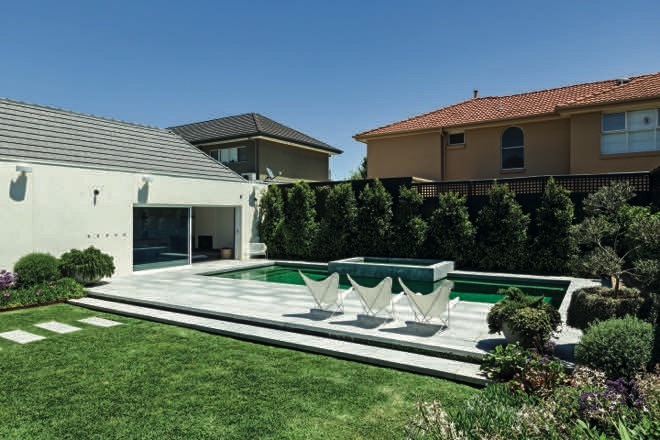 A highly versatile outdoor rumpus room opens to the pool, which is fully automated with iPhone connectivity. This allows the owners to control and operate their pool from wherever they are. 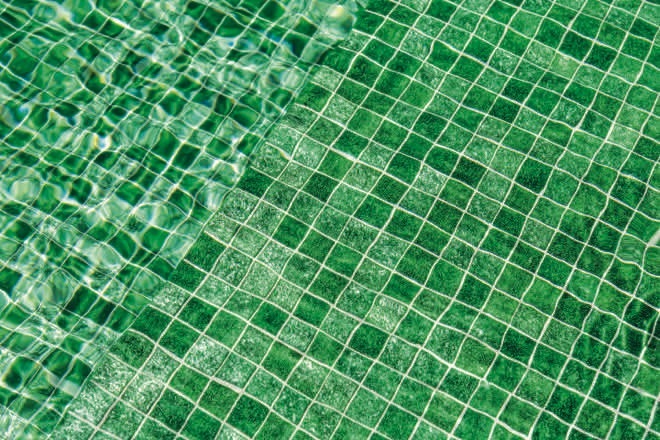 East Coast Swimming Pools was established in 2001 with a strong commitment to quality, service and attentive project management. 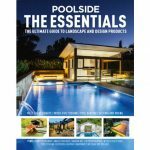 Owner and principal Colin Sloggett has more than 30 years’ experience in swimming pool and landscape construction. East Coast’s emphasis on quality can be seen at all stages of the design and construction process. The company uses quality state-of-the-art materials and techniques together with reputable and reliable tradespeople. 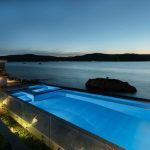 East Coast Swimming Pools can design and construct a swimming pool, spa, landscape or exterior space with attentive project management, and looks after each project from initial concept to design, construction and completion. 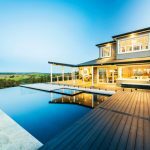 The company’s experience, passion and skill have seen it create stunning pools, spas and landscapes on the Mornington Peninsula, in the Melbourne bayside and south-east suburbs. East Coast Swimming Pools is a member of SPASA and the HIA.